This course has been updated to include 2015 ECC Guidelines and provides instructor candidates with the skills and knowledge to teach the American Red Cross basic-level First Aid, CPR and AED courses. 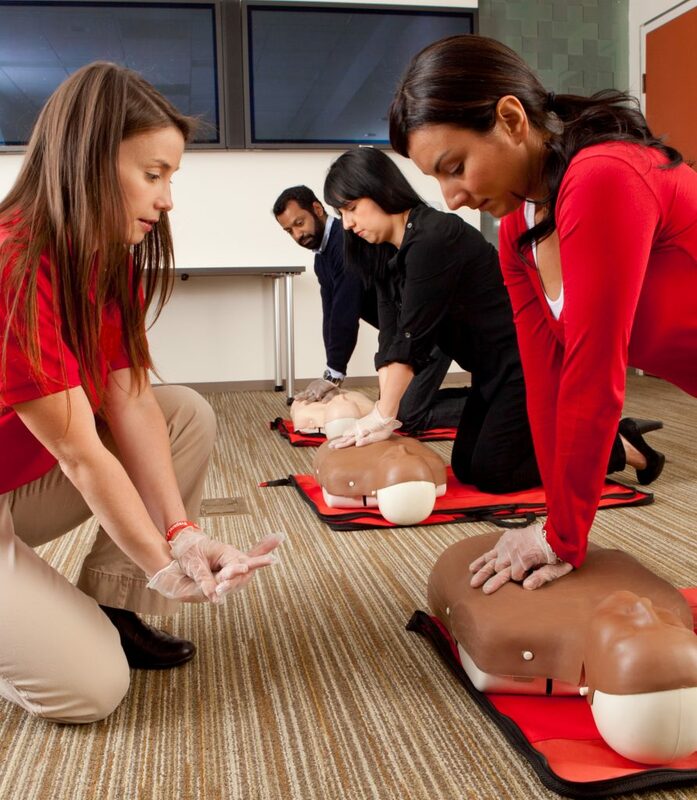 Possess current basic-level American Red Cross Adult CPR/AED certification or equivalent. Complete an online orientation to the American Red Cross. Complete the online First Aid/CPR/AED Instructor Precourse for $37 thru the ARC learning center. Exhibit the characteristics required of an American Red Cross representative and role model. Conduct courses in a manner that helps participants to stay engaged in the learning process. Perform applicable first aid, CPR and AED skills at an appropriate skill level. Ensure participants’ health and safety during training. Maintain complete and accurate records and reports. Plan, organize and conduct the first aid, CPR and AED courses in accordance with the requirements of the specific class they will be teaching. Monitor participants’ practice and provide corrective feedback and encouragement that is consistent with the skill chart. Recognize that the requirements in the skill assessment tool are criteria for ascertaining the proficiency of a participant’s performance. Choose the appropriate course and materials to meet the specific training needs of participants or groups. American Red Cross First Aid/CPR/AED Instructor, valid for 2 years. Prior to the in-class date, all participants must complete an online pre-course thru the Red Cross Learning Center. The Red Cross fee for the online course is $37 which in addition to the class fee. Note: You will not be able to continue in the class if you have not completed the online pre-course by the class start date. For best results use Chrome browser, disable pop-up blockers and enable Flash Player in your browser settings. Create an account for the Red Cross Learning Center at http://classes.redcross.org or log in to your existing account. Click the link below that corresponds with your correct class dates, if the link does not open please copy and paste the URL in your web browser. IMPORTANT! Make sure you select the online course link that corresponds with your in-class dates. Once you are logged in and on the Create Order page, you will see the course has been added to your cart. Click “Confirm” on the Create Order Page. Select Credit Card as the method of payment, enter your credit card information and click “Place Order” at the bottom of the page. You are now enrolled for the Online Course. You may launch the content by clicking the “Go To My Enrollments” button, then click the “Launch” link next to the appropriate course or, you may log in at a later time. A new window will appear. Click on the link to launch the course. When finished, print the certificate of completion and bring it to the class. The online course cannot be taken on a tablet or smartphone. To properly run the online course you must use a Flash-enabled computer with a high-speed connection. Please call our office at 714-602-9796 during business hours Mon-Fri 9am-5pm, if we do not answer (we are most likely teaching a class) so please leave a voicemail and we will return your call as soon as possible. PLEASE BE PATIENT, WE WILL RETURN YOUR CALL! Instructor candidates are required to download, print or purchase the following manuals and materials for the course. Participants may bring the materials to class in either digital format on a laptop, iPad or tablet, or printed hard copy. These materials are available in digital format on the First Aid/CPR/AED Instructor Candidates page. Print versions of these materials are available for purchase from the Red Cross Store. Each Instructor Candidate must complete three Practice Teaching Assignments during the class. You will receive an email with your assigned Practice Teaching Assignments and instructions to prepare for teaching your assigned topics/skills. If you do not receive the email at least 3 days before your scheduled class please contact our office at 714-602-9796. Note: We are not required to provide your practice teaching assignments before the class, we do this as a courtesy to help Instructor Candidates prepare ahead of time. Not receiving an email or not checking your email is NOT an acceptable excuse for rescheduling a class. Practice teaching assignments will be assigned at the start of the class for those who didn’t receive the email. If you decide to leave the class for any reason, you will NOT receive a refund and will NOT be eligible to transfer to a different class. Once the Red Cross has approved the course record, participants will be able to print their certification thru the Red Cross Learning Center. If you require a wallet size certificate card or you need assistance logging in to your account or printing your certification, please contact the American Red Cross Training Support Center at 1-800-RED-CROSS. Additionally, if you ever lose your certification, you can log on and reprint it from your account. Note: We are unable to reset your password, print your certificate or access your account, please contact the Red Cross for assistance. Refund Policy: Class fees are nonrefundable and no refunds will be issued once fees have been submitted. Class materials and supplies such as course manuals and textbooks, CPR masks and all other class supplies are nonrefundable. Transfer Policy: The class transfer fee is $150.00 and registered participants are required to complete a Online Transfer Request at least 72 hours prior to the class date in order to be eligible to transfer. Transfers will only be granted if space is available in a future class with-in 60 days of the original class date. Only (1) transfer is allowed per registration. No Show Policy: If a registered participant is a no-show and absent from their scheduled class, the participant will not receive a refund of any kind and is not eligible for a class transfer. Class Space is Limited: If a registered participant decides to leave the class for any reason, they will NOT receive a refund and will NOT be eligible to transfer to a different class. Cancelled Class Policy: CPR Training Professionals reserves the right to cancel classes as needed. In the event a class is canceled registered participants will be offered a transfer to a different class at no additional charge or a full refund. Visitor Policy: Only registered class participants are allowed in the classroom during training. All visitors must wait in the parking lot. Replacement Certificate Policy: The replacement certificate fee is $25. To request a replacement certificate call (714) 602-9796.